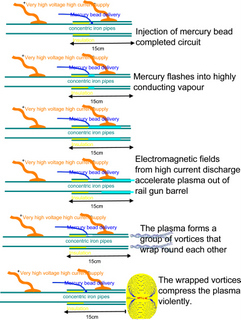 The Mercury Vortex Rail Gun . WARNING Mercury vapour is highly toxic even in very small amounts. This apparatus will instantly convert a bead of mercury into a cloud of mercury vapour. The vortex is extremely hot 2000C or higher. If the vortex detonates it will blow your lab apart. This information is published in the interests of open science. Not so you can try it for yourself in your back yard. This apparatus is extremely simple, small and robust. It consists of two concentric iron pipes with a small gap between them. 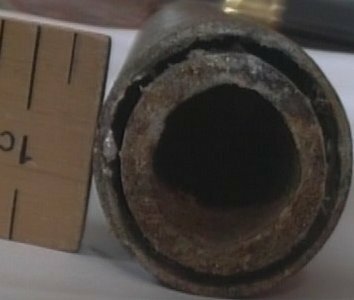 I have used steel water pipe, but all traces of galvanising must be removed from the facing surfaces or the zinc will react with the mercury. An Iron container won't react with mercury, other metals such as copper will. The inner pipe needs to be longer than the outer so that a good electrical connection can be made to it. The pipes are held apart by heat resistant insulation at the end away from the muzzle. Fire cement works well (designed for small repairs in furnaces). The concentric arrangment of the pipes means that the forces generatedby firing the rail gun are symetrical, and the vapour is confined to get maximum acceleration. I have fired this thing supported in a large bucket of dry sand, pointing vertically upwards. For a single shot firing mode, introduce a small bead of mercury into the muzzle (in the gap betwen the pipes) and led it move to the base. Check that it is making a good electrical connection between the concentric tubes with a multimeter. Ensure that you can contain a very hot cloud of mercury vapour and condense it back to mercury. Ensure that there is nothing that will be damaged by a detonation!! Film through arc welding goggles or you will lose the chip in your camera. 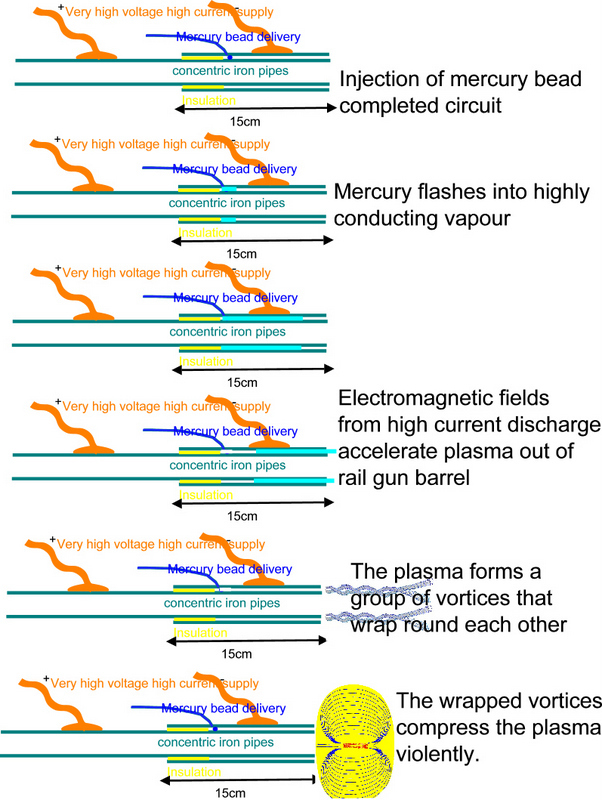 For a slightly more sophisticated system, use the injection of a bead of mercury into the base of the vortex gun as the trigger for the discharge. The end view shows the gun after test firing. Beads of iron have eroded from the steel wall and deposited on the end of the muzzle before cooling. There are two potential vortex modes from this apparatus. The first is similar to a smoke ring, detached from the gun and moving away from it.The second is where small vortices form in the gun and these wrap roundeach other as they are ejected but remain attached to the inner tube. The next step would be to dissolve a little boron in the mercury before firing!!. I have taken the practical experiments as far as my resources will allow. I don't have the facilities to continue in safety, or the instrumentation to measure what is happening. It is far too hot, too fast and too dangerous. But I am sure there are plenty of you who do have the resources and facilities for a few extra experiments. Please report back - keep science open.